Larsen is the only center from the state of Utah to be named to the 2013 Rimington Trophy Watch List, and this is the third year in a row he has been named. 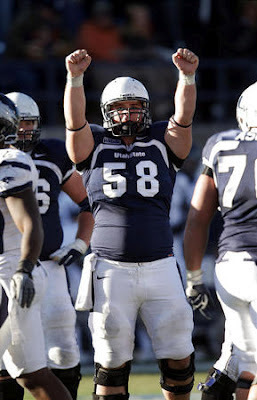 Larsen is Utah State's first three-time Rimington Trophy Watch List selection and only the third USU player to be named to the Watch List, joining Brent DeLadurantey in 2005 and Ryan Tonnemacher in 2007. Along with the 2013 Rimington list, Larsen has also been named a preseason fourth-team All-American by Phil Steele and a preseason first-team all-Mountain West selection by two separate publications. He has been a mainstay of USU's offensive line since he arrived in Logan.